Chumbe Island is a small island off the coast of Zanzibar, Tanzania that is privately owned by Chumbe Island Coral Park Ltd. (CHICOP), which manages the Chumbe Island Coral Reef Sanctuary. CHICOP was established in 1991 to create an ecotourism and conservation education initiative. Chumbe Island was chosen for a sanctuary due to its healthy and biodiverse coral reef system. Noted coral taxonomist Prof. J.E.N. Veron visited the reserve in 1997 and established that it has "one of the most spectacular 'coral gardens' to be found anywhere in the world" and that "the Park is exceptionally well managed". Chumbe Island Coral Reef Sanctuary protects incredible marine biodiversity, including an array of invertebrates, 474 recorded reef fish species, blacktip reef sharks, and many other creatures. It is an important feeding ground for the endangered green turtle and critically endangered hawksbill turtle. Humpback dolphins, spinner dolphins and Indo-Pacific bottlenose dolphins have all been observed in Chumbe Coral Reef Sanctuary as well. The reefs in Chumbe Island Coral Reef Sanctuary are some of the most resilient known in the Western Indian Ocean. During previous recorded bleaching events, its corals have bleached and died at much lower levels than others. CHICOP managers attribute this resilience to “few other stressors being present” (i.e. no fishing or destructive activities taking place in the sanctuary). Chumbe Island is a small island privately owned by Chumbe Island Coral Park Ltd. (CHICOP) off the coast of Zanzibar, Tanzania. The park includes a fully protected coral reef sanctuary (0.3 km2) and forest reserve. After the discovery of Chumbe's incredibly bio-diverse reef eco-system several years of campaigning by CHICOP succeeded in officially closing the fringing reef West of Chumbe Island in October 1992. With Chumbe being located upstream of the most important fishing grounds opposite Zanzibar's capital, Stonetown, the Chumbe reef provides a protected breeding ground for fish, corals and other species which can then spread out to recolonize nearby overfished and degraded areas. This makes Chumbe's protection of vital importance to both the preservation of bio-diversity and the fisheries economy in the region. On the 24th of December 1994 the Zanzibar Government officially gazetted the reef as the "Chumbe Reef Sanctuary" and with this Chumbe had become the first marine park in Tanzania. Following this Chumbe became registered as a UN recognised Protected Area. Monitoring surveys conducted reveal that the protection of the reef to the west of Chumbe Island from 1992 by CHICOP has already shown good results. Coral growth and diversity is among the highest in the region, and Chumbe has at least 90% of all the hard coral species that have ever been recorded from Eastern African reefs (Veron, letter 27.3.97). Various reports by IMS state that the diversity and populations are greater on Chumbe in comparison to non-protected areas around Zanzibar (and indeed further afield). Ongoing surveys suggest that some of the fish families are of a greater size and abundance inside Chumbe’s protected area compared to other reefs on the west coast of Zanzibar. For example, groupers and triggerfish seem to be larger than in other sites and sweetlips more abundant. Nearly 400 species of fish belonging to 50 families have been recorded, including Giant Groupers -Epinephelus lanceolatus- (up to 1m length), which is a rare sighting in shallow reefs (Mildner-Fiebig 1995). The rich fish life has attracted seabirds, such as the rare Roseate Terns -Sterna dougalli-, which have bred successfully on Chumbe. In 1994 around six hundred were ringed by an ornithologist to monitor their movements (Iles 1994). Many lobsters have found a safe haven on Chumbe. On land the rare Robber or Coconut Crab -Birgus latro- is common on Chumbe. The IUCN red list of threatened species describes this species as ‘data deficient’ and it is considered rare elsewhere in the Indian Ocean. The achievements of CHICOP have been widely acknowledged by international conservation organisations, amongst them the World Conservation Union (IUCN), the World Wide Fund for Nature (WWF), UNESCO-Directorate for Environment and Development in Coastal Regions and Small Islands (CSI) and the United Nations Environment Programme (UNEP). 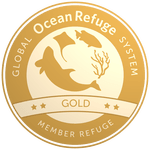 The Chumbe Reef Sanctuary is now fully registered as a marine protected area by the World Conservation Monitoring Centre (established by UNEP, WWF and IUCN) in Cambridge, United Kingdom. The noted coral taxonomist Prof. J.E.N. Veron from the Australian Institute of Marine Science (AIMS) visited the reserve in February 1997 and established that it has "one of the most spectacular 'coral gardens' to be found anywhere in the world" and that "the Park is exceptionally well managed". Boundary for Chumbe Reef is marked by bouys along the western side of the island. fishing info: No fishing allowed in this area.